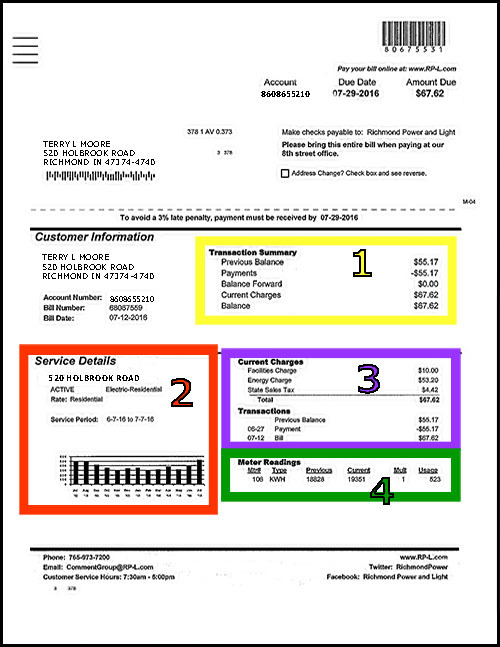 Four sections of your electric bill are explained in more detail. If a bright yellow highlight appears on a bill the account has a past due balance at the time the monthly statement is mailed out. If your bill is current, you will not see this. The most common method for billing is where you are billed each month for the amount of electricity you used between your last two readings. See the "Customer on Regular Billing" below. The other billing method is where you agree to be put on a "budget" plan. Learn how the budget plan works. Previous Balance - Indicates the balance of your last statement. This amount is usually what you are charged for electric service for the previous month. However, if your account was not 'paid in full' last month, that amount will also be reflected in this line. Payments - Any payments you have made on your account since you received your last statement are subtracted. Balance Forward - Previous Balance minus Payments. 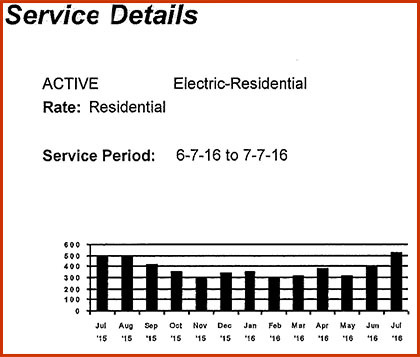 Current Charges - The amount you are charged for the current month's electric usage. Balance - The current balance is derived from adding the previous balance, adding or subtracting any adjustments or corrections, subtracting payments, and adding the charge. Most often, the current balance of your account will equal what you are charged for this month's usage. This graph provides a visual look at your usage history. From this you can see what months you use more electricity. Please note that the shaded areas represent the average kilowatt-hours you use per day for each month. Once you have lived at a residence for a 12-month period, you should begin to see a pattern in your graph. This may also help you identify what months to expect higher usage, and possibly help you see where you can change a few habits that would decrease your usage. For a normal residential account with one meter, you will only see one service address listed. If you have more than one service agreement (different meter locations), then you will see the following for each account. A. The facilities charge, listed on all residential and commercial bills, is RP&L's way to offset the costs of the facilities that serve each customer. Your bill consists of two components, energy and facilities (also called transmission and distribution). This charge is shown as a separate line item to give the customer a better idea of the cost of energy versus the cost of facilities. B. Amount you are being charged for the quantity of electricity supplied. Energy is measured in kilowatt hours (kWh). The longer something is turned on the more kWh it uses. If you do not pay your bill by the due date, a penalty is applied to your account for late payment. If you have paid your bill on time, this will not appear on your statement. 1. When a payment is posted incorrectly a transfer is made to correct this. 2. When a stopped service agreement is not paid by the due date the remaining balance on that service agreement is transferred to an active service agreement in order to close out the financial side of the stopped service agreement. Your statement includes the following section to help you see exactly how much electricity you have used over the last month, and how the amount of your usage is calculated. A Unit of measurement for the current usage. B Shows last month's reading which is needed to calculate your current usage for this month. C Shows this month's reading which is also needed in calculating your current usage. D The multiplier applied to the difference of readings (C minus B) to obtain kilowatt-hours. E Current usage is calculated by subtracting your Current Reading (B) from your previous Reading (C).